Yoga studios are THE best place for scoping out fantastic pedicures! Come on we all do it. You are holding a pose for what seems like eternity. Your mind starts to wander and you find yourself taking a quick peek around at the toes in the studio, if anything to simply get your mind off the pain that comes with yoga splits. Yogi’s have great looking toes! Aside from grays, a trend I’ve spotted quite a bit while holding my downward dog is the dark purply/brown color that is so popular now and a personal favorite. 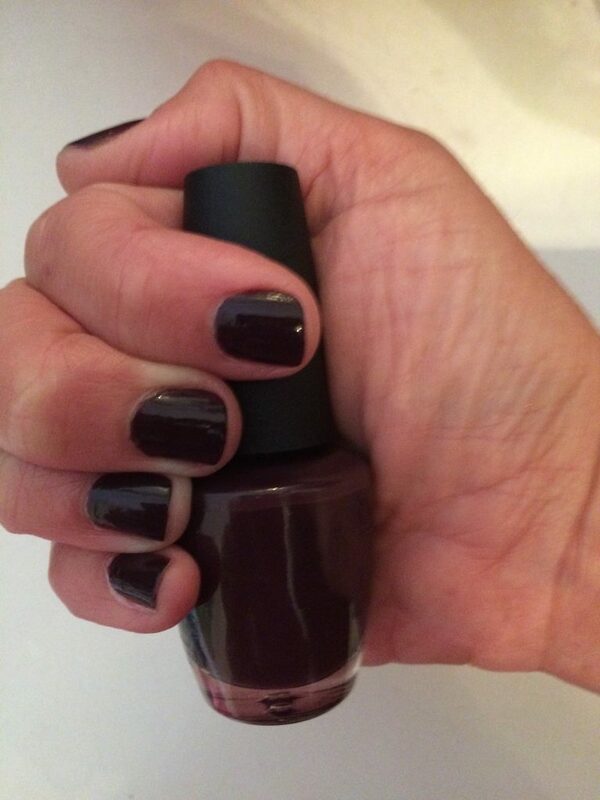 Shades of red/wine always popular. This week there was a surprise! Someone in class was moving on to Spring! “You go girl”! I said to myself. 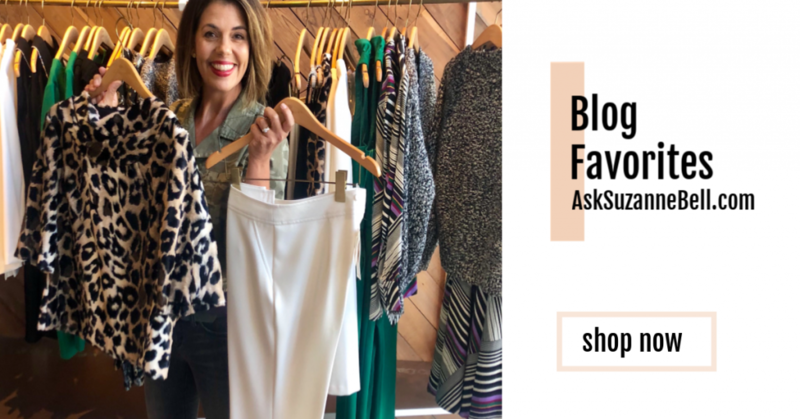 If you missed the AskSuzanneBell roundup featuring shades of gray polish for everyone, check it out HERE. 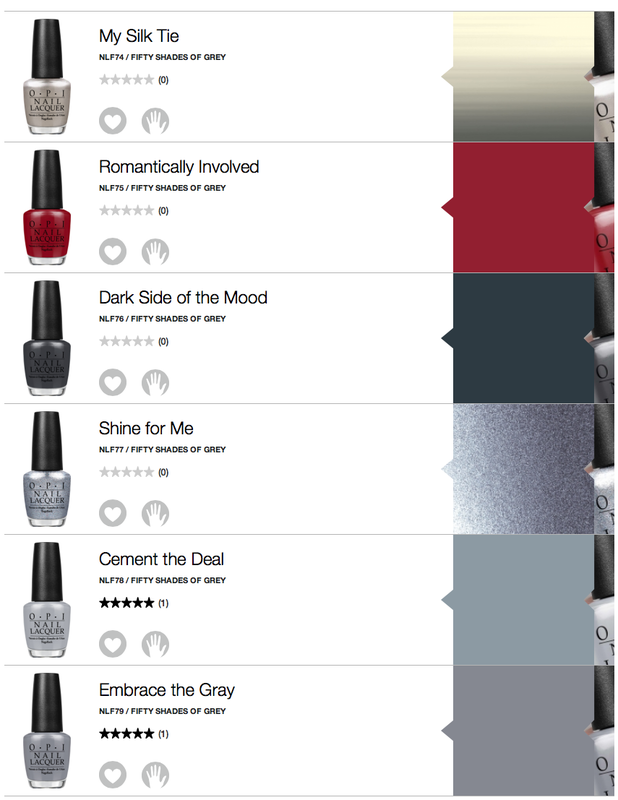 OPI has now released their “Fifty Shades of Grey Collection” as a tie in to the movie of the same name HERE. 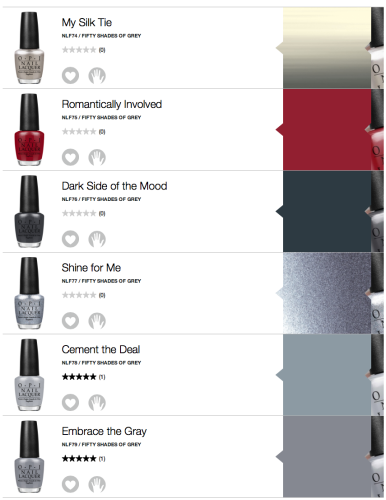 The collection includes 5 shades of gray and a gorgeous red color just in time for Valentines Day. I have read mixed reviews on the formula used in Dark Side of the Mood specifically as to how it goes on, but it is a unique color. Done with winter? 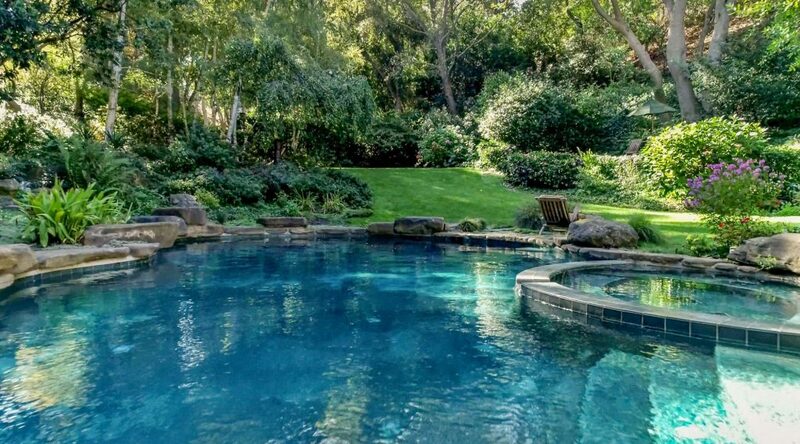 Headed on a tropical vacation? My girlfriend Celeste; trendsetter and fellow yogi was wearing Chanel Starlet HERE and it looked fab! The color was so pretty I couldn’t take my eyes off it! “575 Starlet” will be going with me on my next vacation for sure! While perusing a few of my favorite blogs this past weekend, I came across a review of NAILSINC over at YUMMOMUMMO! HERE . 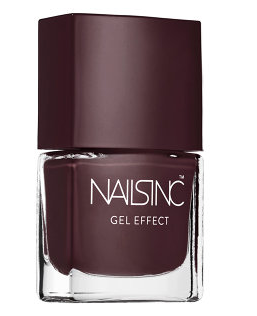 A polish that delivers a plumping gel effect for glossy, salon-quality nails. 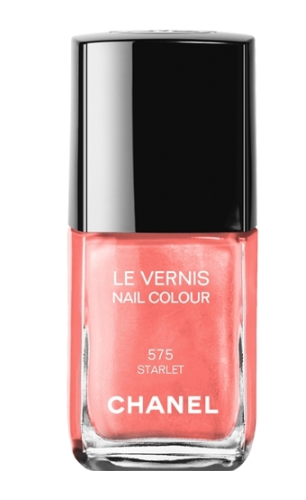 This polish provides a high-shine, superglossy finish without the need of a UV lamp or professional removal process. Gel Effect polish contains the same plumping technology as a salon gel manicure and lets you create the same look at home with ease. Formulated with revolutionary plasticiser technology, Gel Effect polish creates a gloss like you have never experienced before with standard nail polish. The gel polish formulation contains a very high level of solid pigment to create flawless application with no streaking or dragging. The gel formula glides on effortlessly and the extra wide brush ensures easy application. I love color on my nails, but unless I am going to a party the same evening, my standard manicure consists of a “cut short and buff ” as my polish consistently chips after 2 days, every time. After reading the YUMMOMUMMO! review HERE I am going to give this polish a try. I have friends that use Gel and my guess is nothing can match the staying power of gel polish. I personally have not tried Gel as I have heard it is very difficult to remove, that honestly is what has stopped me from trying Gel. So, I am going to give this guy a try and see what happens. If it says on more than 2 days for me it’s a win. If I can touch up once in the week and I’ve now gone a whole week with nice nails that is a win as well. 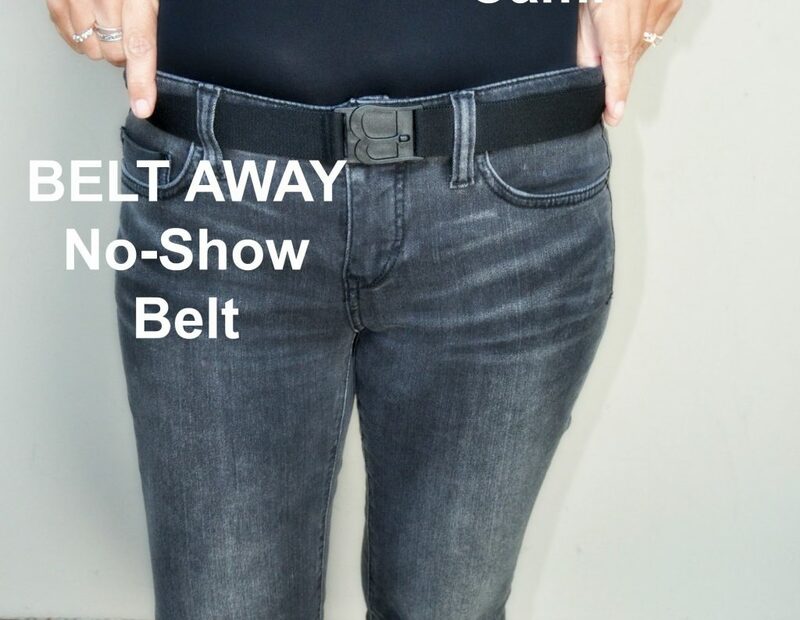 If if comes off easily…sold! Stay tuned, I will be sure to let you know how it works for me. we thought it turned out great! 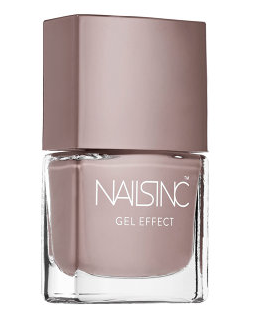 Anyone out there tried NAILSINC? Do share! Any other tips for getting those nails to stay unchipped without the UV Gel process? Feel free to leave a comment, I know we would all love to hear! You have to check out Deborah Lippman psuedo-gel polish base and top coat! It works like a charm and I now schlep it with me to all my mani appts. You put the base on first, your normal nail polish and then top with the clear top coat. My nails were getting damaged from gels so this one gives the smooth, shiny top coat without the chemicals or nastiness of gel polish. I reapply every other day or so if I remember and it makes my main last 7 days usually. I seriously am addicted! And have even gifted it bc it is that good! Hey Molly! Thanks for the great tip! I have not seen or tried it so I am going online now to check it out! Thanks for the great tip!